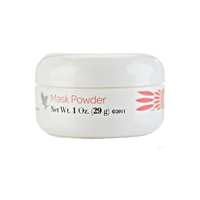 Add one mixing spoon of Mask Powder to the mixing bowl. Combine with one mixing spoon of Aloe Activator until the mixture has the consistency of lotion. Use the applicator brush to apply a thin, even film from the neck upward. Relax in a reclining position, limiting facial movement for approximately 30 minutes. Apply a moist towel to the face to soften the mask, then gently remove remaining mask and rinse with warm water. Follow with toner and your favourite moisturiser. Albumen, zea mays (corn) starch, kaolin, allantoin, chamomilla recutita (matricaria) flower extract, diazolidinyl urea, fragrance, red 27 lake (CI 45410).